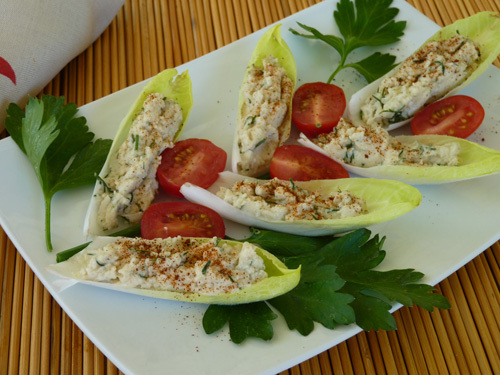 These make fabulous finger foods for picnics, potlucks, receptions, and events of all kinds. To make the cashew dill cheese, place soaked cashews, water, probiotic powder and salt in a high-speed blender like the Vitamix. Blend, scraping the blender sides occasionally with a spatula, adding more water if necessary to keep the blades running. Process until the individual nut pieces are well broken up. Transfer to a nut milk bag or cheese cloth and place in a sieve over a bowl. Place a water-filled bowl as a weight on top of the cheese in order to drain off any extra water and leave on the kitchen counter overnight to culture. You may or may not see water drained from the nuts the next day. After 12 to 24 hours transfer cheese to a bowl, and mix in the dill with a spoon. You will get a soft cheese consistency as the end result. Wash and pat dry the endive leaves. Slice a little from the center rib on the outside, flattening the rib so it sits well on the plate. Use about 1 Tbsp of cheese per leaf. Sprinkle with paprika, arrange on a plate or tray, and serve. Note: Preparation time is 20 minutes plus soaking and fermenting.